Drain and rinse garbanzo beans and cut tops off strawberries. 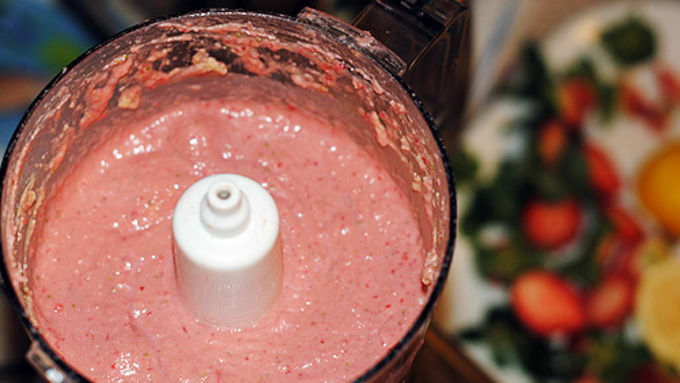 Put all ingredients in food processor except strawberries and begin mixing. Once mixed, add in strawberries. You might have to mix in several batches to get everything incorporated. Mix until consistency is creamy and color is light pink. Serve with wheat crackers. Considering I eat it at least once a day, I think that 25% is a fair guess. I discovered hummus in college at the salad bar, and I’ve never looked back. I take hummus to work, put it in my salad, bring it to a party; I pretty much take it wherever I go. It’s an incredibly versatile food made primarily of chickpeas, also known as garbanzo beans. The fact that it’s also healthy is just icing on the cake. Today I’m going to enlighten you on a few different variations of hummus. Then, maybe we can meet and have a hummus-off and see who eats more hummus? (I win.) As I mentioned, hummus is made with chickpeas but it has a few other main ingredients as well. Tahini (sesame paste), lemon, olive oil and garlic are all part of what makes hummus hum. (Hee-Hee.) There are plenty of great pre-made varieties in the store, but if you’re trying to eat less processed food, or simply like making things from scratch, try this recipe for Hummus and Pita chips. Make this and pair with veggies, crackers or homemade pita chips for a classic snack that’s always in style. The cool thing about hummus is that the base of it (chickpeas) gets mashed up and it takes on the flavors (and colors) of whatever you add to it. But it always has that creamy, hearty, hummus-y consistency. 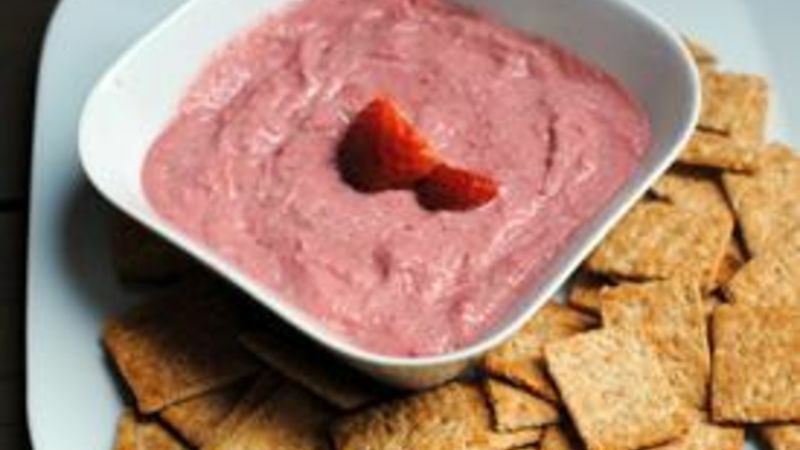 While I’ve seen great savory flavored hummus, I’d never seen a sweet hummus, so I decided to make this fruity version. Pairing the classic hummus ingredients, I added strawberries to the mix. Not only did the hummus take on a pretty pink color, it had a great strawberry taste! To let the sweet taste stand out, I added less of the tahini and zero garlic. Call me crazy, but garlic and strawberries just didn’t work together in my mind. The result was my super yummy Strawberry Hummus recipe that tasted like nothing I’d ever had before!